With proper safeguards, water currents can be harnessed out of sight. Mounted on a shaft, the curved foils, or blades, of an Ocean Renewable Power Company (ORPC) turbine are designed to be rotated by a strong horizontal current of water. In contrast, traditional hydroelectric stations rely on extracting energy from the vertical drop of impounded water. "We’re not seeing a heck of a lot here,” laughed Nathan Johnson as he stared off into the fog that choked the Western Passage, near Eastport, Maine. “But we have documented here a lot of harbor seals and harbor porpoises. Also we have larger mammals, including minke whales.” Part of the route leading northwest from the Bay of Fundy to Passamaquoddy Bay, the Western Passage separates Moose Island, where Eastport is located, and Canada’s Deer Island, to the northeast. 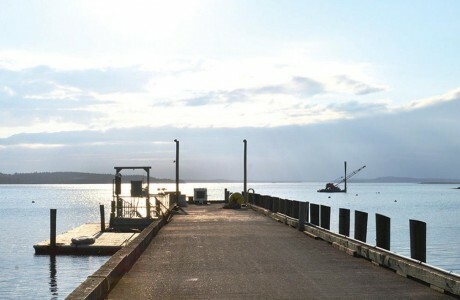 Johnson is part of a team that is studying the Western Passage as a potential tidal power site. His company, Ocean Renewable Power Company (ORPC), www.orpc.co, has already deployed a tidal turbine west of Moose Island, in Cobscook Bay. The whole area is a complex of channels, bays, and coves that experience a cycle of low and high tides that differ by about twenty-five feet, making this is an ideal site for such projects. View from Maine’s Moose Island toward Cobscook Bay: Driven by strong tides, an ORPC turbine installed a mile out in the bay provides 150 kilowatts of power, which is fed into the electric grid and used by the community of Eastport. Johnson was raised on an island in Maine’s Casco Bay, 200 miles to the southwest. His family has been fishing since colonial days. Eastport is a fishing village too. Its life centers on its harbor and its lobster, scallop, and fishing fleet. Granite cliffs encircle much of Cobscook Bay, and if you were to walk along them you’d find the air filled with great black-backed and herring gulls. Below you, on the water, you’d see lobster boats tending their pots and other boats servicing the aquaculture farms. You wouldn’t see the tidal turbines, which are deep below the surface of the bay, invisible except for the buoys that mark out their area. 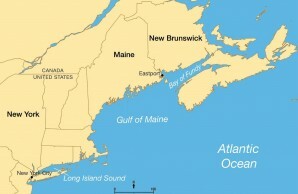 Map, above, shows the sites of two tidal power projects located miles apart on the Eastern Seaboard. 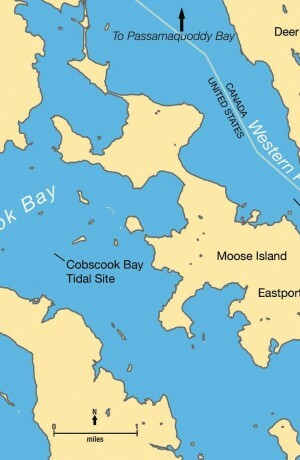 Right: An ORPC turbine is already located in Cobscook Bay; another site is under study east of Moose Island. The Federal Energy Regulatory Commission requires environmental impact studies to be made before such projects are approved, with follow-up monitoring afterward. The East River is constrained by concrete breakwaters, which give it the look of an industrial canal instead of a river. In fact it is not a river at all, but a tidal strait that connects New York Bay to the south with Long Island Sound to the north. To the south it separates Manhattan Island, on its west side, from the Long Island boroughs of Brooklyn and Queens to its east. Near its northern end it connects with another strait, the socalled Harlem River, which separates Manhattan from the Bronx and joins the Hudson River. The East River proper continues to the Sound through Hell Gate, a stretch of water infamous for its furious tides and currents. New York City’s East River, the site of Verdant Power’s Roosevelt Island Tidal Energy project, experiences tidal flows of six to seven miles per hour. One of Verdant Power’s turbines is installed in the East River, between Roosevelt Island and the Borough of Queens. Each turbine is about sixteen feet in diameter and produces 36 kilowatts of electricity. 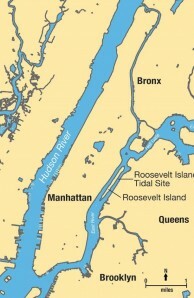 Within the East River is two-mile-long Roosevelt Island, considered part of the Borough of Manhattan and connected to the rest of the city by an aerial tramway, a bridge, and a subway stop. It also provides footing for the Ed Koch Queensboro Bridge, which crosses from Manhattan to Queens. The turbines lie on the east side of Roosevelt Island. Although the tides rise and fall only six to ten feet, they race through the narrows at up to six miles per hour, a jogging pace, which makes this site attractive to tidal power developers. A little to the south of the turbines, in Queens, is the competition, the Ravenswood Generating Station. That more conventional plant can produce nearly 2.5 gigawatts of electricity from natural gas and oil, about a quarter of what New York City needs. Oil barges are moored in front of the plant, feeding the city’s insatiable appetite for power. 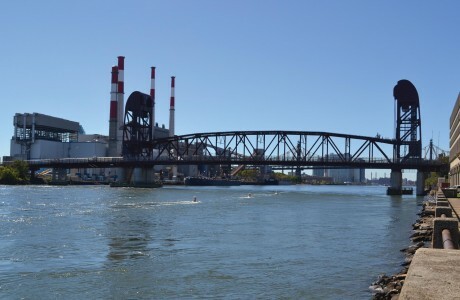 View of the East River looking south, toward the bridge linking Roosevelt Island (right) with Queens: Verdant Power’s turbine site lies between Roosevelt Island and the buoys, whose wakes reveal the incoming tide. The tall stacks in Queens belong to the Ravenswood Generating Station, which burns natural gas and oil. When most people think of tidal power they envision a traditional design in which a barrage, or dam, impounds the waters of high tide in an estuary and then later releases those waters through a turbine. This is what is happening in the Rance River in France, in the Annapolis River in Nova Scotia, and most recently at the Sihwa Lake project in South Korea. But that design will only work in places with exceptionally high tides. The dams also completely alter the ecology of estuaries where they are located and so have been avoided in most places in recent years. 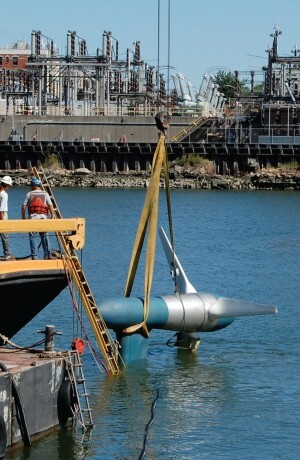 Modern tidal turbines are in many ways closer to wind turbines than to traditional hydroelectric stations. They extract energy from the horizontal flow of water instead of from its vertical drop. To distinguish them, these systems are referred to as Marine Hydrokinetic (MHK) turbines. Over the last decade companies like Verdant and ORPC have been working with the Federal Energy Regulatory Commission (FERC) to develop guidelines for this technology and the environmental studies surrounding such projects. A decade ago it was not clear whether these turbines could survive the harsh marine environment. It also was not clear whether the environment could survive the constant churning of the turbines. The ORPC turbine has its axis perpendicular to the direction of the flow of water. Its curved blades, or foils, are reminiscent of an old-fashioned push lawnmower. (Technically, a motor or engine will drive a blade, whereas a hydrofoil or airfoil will drive a generator, but both terms, blade and foil, are used.) The company chose this design, in which they sacrificed some efficiency, in the expectation that it would be more robust. Ideally, they would like to drop a turbine in the water and not have to revisit it for years. The turbine in Cobscook Bay has an active area ninety-eight feet wide and seventeen feet tall (atop a fifteen-foot-tall support frame) and can produce about 150 kilowatts of power. The Verdant design looks a lot like a cross between a wind turbine and a ship’s propeller. It has three foils that radiate from the central body, which contains the generator. It is more complex then the ORPC design, since it swivels four times a day to face the tide. But it is also a bit more efficient at turning tidal currents into electricity. With a diameter of about sixteen feet, it is smaller than ORPC’s turbine, and one turbine will only produce about 36 kilowatts. Verdant expects to deploy these turbines as part of a larger array, however. “People at first thought this was going to be a fish blender,” Christopher R. Sauer, co-founder of ORPC, once told me. In fact some of the first prototypes did spin quickly—and produced little power. The present generation of turbines for both Verdant and ORPC rotate at about 40 RPM and are much more efficient. But right from the start, it was recognized that these turbines had the potential to adversely effect their environment, and so for the last several years there have been extensive environmental studies surrounding them, examining their effects on everything from fish to mammals. Verdant’s Dean Whatmoor, a “jack-of-all-trades” whose work includes supporting the dive team from shore, describes the bottom of the East River as a barren moonscape. “The riverbed is sheer bedrock, it’s not sediment like most rivers, like the Hudson,” he told me. “Some of the rocks or boulders down there range from the size of chairs to the size of automobiles. 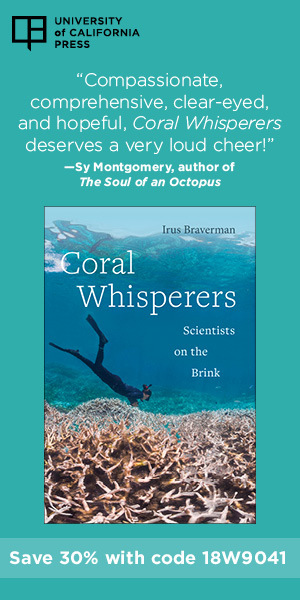 So for divers to drag their umbilical cords from shore sometime presents problems.” The site of ORPC’s turbine in Cobscook Bay has also long been barren. The bottom has been dragged repeatedly for scallops. That makes the benthic, or deepest, regions of both sites sound uninteresting, but FERC, as well as other federal and state agencies, have insisted upon their monitoring. The benthic studies are a good example of the “Adaptive Management System” at work. Briefly, to obtain a FERC license a developer must have a plan in which a team of experts is assembled who will periodically review the data and perhaps recommend that the monitoring be modified. This is in recognition that at the outset it may not be clear what the most important issues in a region are. The team may include technical experts from governmental agencies and universities and other environmental consultants. Recently the tidal facility at Strangford Lough in Northern Ireland has discontinued intense environmental monitoring because after numerous studies and reviews, scientist concluded that the effects of the turbines were negligible. That is a result that both Verdant and ORPC are striving toward. Back in Cobscook Bay, however, there has been a noticeable effect. The structure upon which the turbine is mounted and the area around it may be acting as a marine sanctuary—a reef effect. The floor of the bay around the turbine is becoming ecologically more vibrant then the rest of the bay, which continues to be dragged for scallops. Cobscook Bay is alive with bird activity, with more than two dozen species sighted at the project area. Eiders, grebes, loons, and mergansers have all been seen here, as well as eagles, guillemots, herons, and storm petrels. There is also a whole range of gulls: Bonaparte’s, glaucous, great black-backed, herring, and ring-billed. The East River might not be quite as rich, but in fact there is a bird sanctuary just north of the site where black-crowned night-herons, glossy ibis, and great and snowy egrets, as well as black-backed and herring gulls, have been counted. It is the cormorant, however, which is of particular interest. The double crested cormorant is known to be able to dive to twenty-five feet, which means it could come into contact with Verdant’s turbine foils. The ORPC turbines are much deeper, about fifty feet below the surface at low tide. But long-tailed ducks, loons, murre, great cormorants, razorbill, and black guillemot could dive down to that turbine’s zone. So far there has been no evidence of interaction between birds and turbines. But if the bird’s food supply, the fish and the crabs they live on, is disturbed, there could be an effect, so observations continue. Whereas birds may at times dive into the path of the turbines, fish live in that zone. So both projects have performed extensive fishery studies. In Maine this is especially important, since the local economy is heavily dependent upon the fishing industry. Independently, both projects have selected similar tools: sieve nets to catch and count fish, various types of sonar, and also tracking of radio-tagged fish. With this data they charted the distribution of fish at the site before and after the turbine’s deployment and compared that to an undisturbed site a few miles away. They watched the number of fish and where they swam at various tides and seasons. They tracked schools and individuals. They learned a lot about the habits of fish in Cobscook Bay, but could not detect any change in those habits when the turbine was in motion. Alewife, flounder, hake, herring, mummichog, silversider, stickleback, and more then two dozen other species have been netted in Cobscook Bay. In the East River the list is a bit shorter: blackfish, bluefish, flounder, hake, mackerel, sea bass, striped bass, skate, and weakfish. But the East River may also host the Atlantic and shortnose sturgeon, which are on the endangered species list. To address this, Verdant set up a listening station for radiotagged fish and became an active member of ACTNet, the Atlantic Cooperative Telemetry Network. A number of universities and marine labs have implanted radio transmitters in thousands of fish and then released them into the Atlantic. The network also includes listening stations along the coast, which record when a tagged fish passes by and then share that data. From this researchers have tracked the migration patterns of individual fish along the Eastern Seaboard. 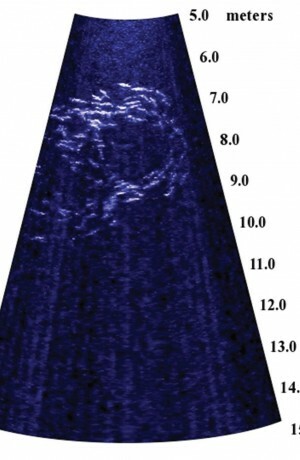 Perhaps the most visual tool, used at both sites, is the DIDSON, or “Dual-frequency IDentification SONar.” DIDSONs produce real-time images of fish and turbines in the darkest and most turbid of waters. With a DIDSON researchers could watch exactly how fish interacted with the turbines. In the East River they saw that at slack tide, when the turbines were idle, fish would swim right through them. However, when the currents were strongly flowing, fish tended to avoid that region completely, favoring instead the slower waters along the edge of the channel. In Cobscook Bay they reported similar observations. Small fish swam through the turbines and larger fish avoided them. In all the hundreds of hours of watching the DIDSON at both sites, no one has yet seen a fish strike. A DIDSON (“Dual-frequency IDentification SONar”) image reveals a swirl of fish in New York City’s East River, a tidal channel. Despite the urban location, fish, birds, and marine mammals all could be affected by the presence of turbines. With a DIDSON researchers can watch exactly how fish interact with the turbines. To help make sense of this, Tomichek developed a “fish strike model,” a way of calculating the probability of a turbine foil striking a fish. She considered fish size, numbers, and swim speed; the rotation rates of the turbines; and a number of other factors. She then calculated the probability of a foil striking a fish and arrived at a non-negligible result, that is, an expectation that some fish would be struck. Missing from her model was one important factor: a measure of how actively fish try to avoid the turbines. When I asked Johnson and Colby which species they are most interested in, they always started with the fish and birds on the endangered species list, because they have a unique legal status. And then they immediately added marine mammals, because of the Marine Mammal Protection Act. New York Harbor is home to harbor seals, so observers at Verdant’s site on the East River have been looking for these seals. However, so far none have been spotted in the area. On this point, Eastport, Maine, is very different. For several decades, Moira Brown has been watching whales from small boats in the Bay of Fundy for the New England Aquarium. She is Canadian and splits her time between Boston, home of the aquarium, and the area near Eastport. Her primary interest is the right whales of the Bay of Fundy area. 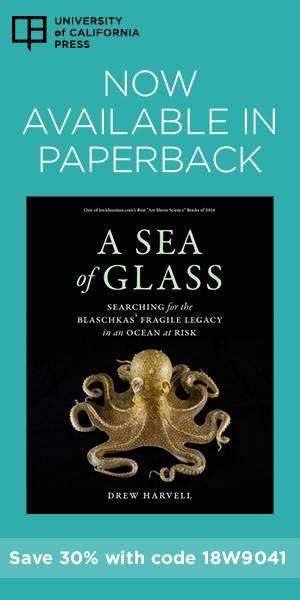 She was instrumental in getting shipping lanes rerouted to reduce the probability of whales colliding with ships; it is something she considers one of the great successes of her career. The currents that make this site attractive for power development are exactly the same currents that stir up nutrients and make the area attractive to fish and marine mammals. Brown’s ultimate evaluations might make the new project more difficult for ORPC, but that is precisely why FERC requires this extensive environmental monitoring. So do marine hydrokinetic turbines adversely affect their environment? After all these studies no one has seen a turbine foil strike a fish, bird, or marine mammal. But there are other issues too. These turbines produce noise. Again all studies say the levels are acceptable and don’t harm the environment. 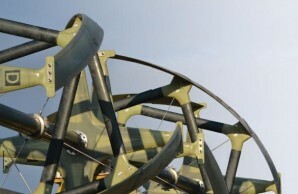 The turbines also affect the flow of the water, slowing it slightly and adding some turbulence. If they didn’t, they couldn’t produce energy. There could be some sort of cumulative effect. In the end, a way of gauging the health of a region might actually be to watch the minke whales or cormorants. Brown kept reminding me that those big mammals and birds go where the food is. Their presence tells you about the ecological system that supports the top of the food chain. Tidal power will not solve the world’s energy and carbon problems, at least not in the short term. Hydrokinetic visionaries do talk about tapping the power of the Gulf Stream, but those are massive projects in the distant future. Meanwhile, however, the new power source is bringing together people who work in this field from two directions: technology and the environment. Engineers are finding themselves quite taken with marine life, and field biologist are fascinated by the power in the water.